With the start of the third trimester, it was time to reintroduce to my new students how to properly write chemical formulas with those polyatomic ions that they had become familiar with fourteen weeks ago during the first trimester. Since it been such a long gap of time since some of my student's last chemistry lesson, I needed my students to review and to practice once again writing chemical formulas correctly before we started calculating molar masses. In the past, I had used the app Chem App Lite with the iPad to allow the students to practice balancing charges and writing their chemical formulas correctly. However, as it often goes with technology, ....I found that Chem App Lite was no longer available on the iTunes store. So I decided to search for another app that would allow my students the same type of practice. 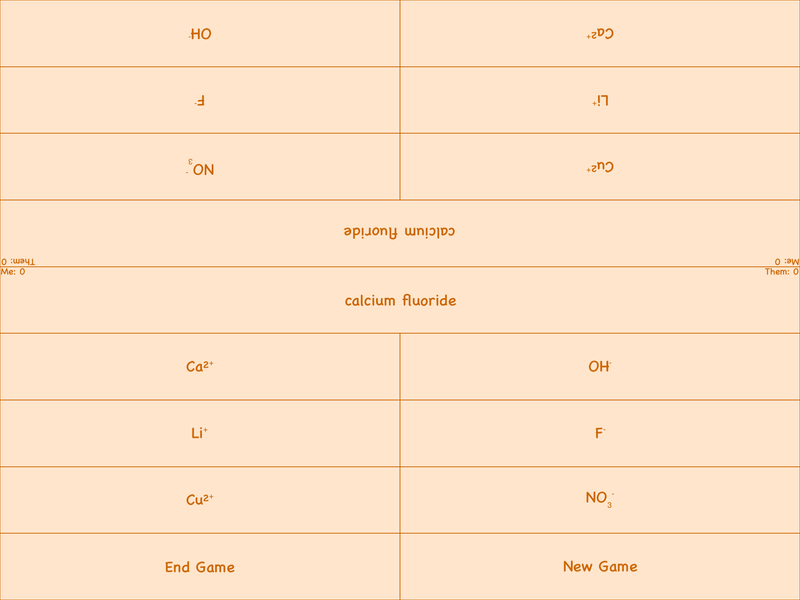 In my app store search, I found Chemical Formula Challenge by Zhang Bozheng. The app is very similar with some added bonuses. 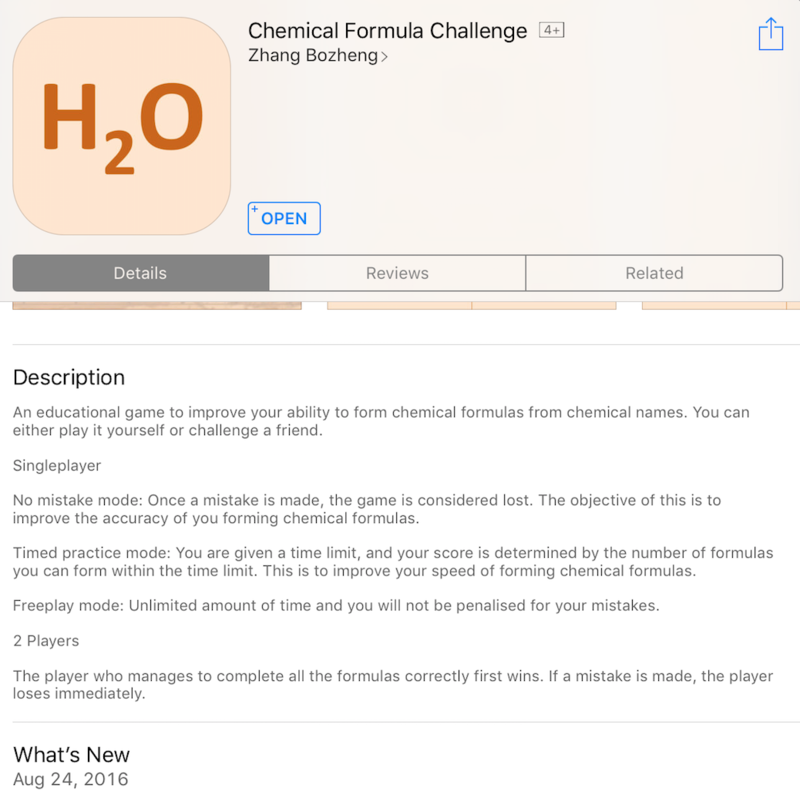 According to the app store description, Chemical Formula Challenge is "An educational game to improve your ability to form chemical formulas from chemical names. You can either play it yourself or challenge a friend". The app features different levels of play such as easy, normal, and hard regarding the difficulty of the ions. As an example, beryllium chloride is considered "easy" while lead II nitride is considered "hard". The app then gives the user several ions to choose from and the user must then select the correct number of ions needed to balance the formula correctly. The game also allows for the ion charge to be shown or to be removed during play and does allow its background music to be turned off. Next, the different game modes include no mistakes (one mistake and game over), a timed practice with every mistake forfeiting 1 second, and freeplay that will keep track of the total number of formulas formed. What became an added bonus was two player mode. In two player mode, users would position the device between them so that each user is looking at the screen from either the top or from the bottom. The screen is then split so that it is right side up for each user. 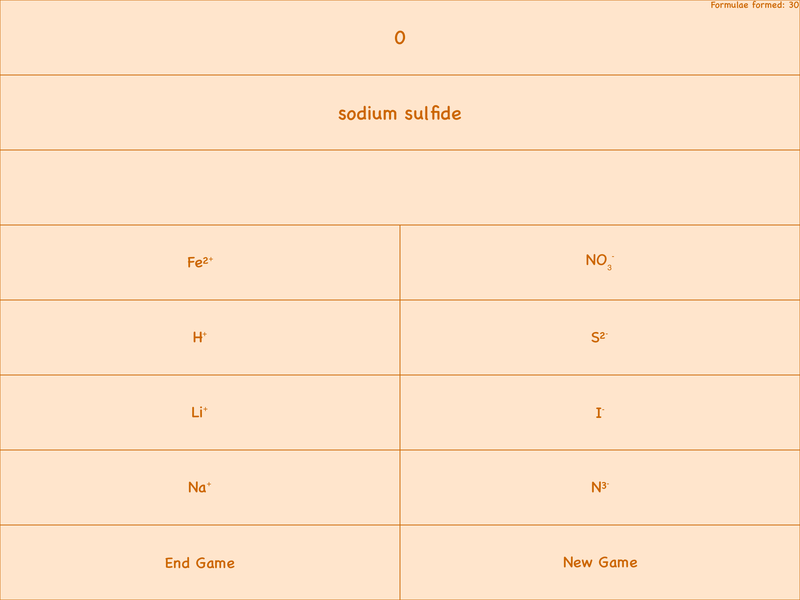 Once the game starts, the same chemical formula is projected for each user and the user must then select the correct combination of ions to correctly match the given chemical formula name. As the user inputs the correct formula it moves onto the next. If a mistake is made then it is game over for that user and the other user is considered the winner. You can input the number of formulas that must be answered before it proclaims you the winner. Well, the app was an instant hit with the students as they simply used it in free play mode to practice their formula writing skills. The students quickly recalled the roman numerals and their meaning and starting recognizing the polyatomic ions and the rules associated with when to use parenthesis and when not too. Since we have been in the middle of March Madness and many of my students have been filling in their brackets, many have turned our chemistry excercise into a challenge among students that they themselves initiated with the finals taking place before Spring Break. I came in as a 1 seed! I hope your students enjoy it as much as mine have.